Select which package fits your needs! Love tea? We recommend you try the Tea Teaser or Tea Lovers Package. This mini package comes with 2 specialized loose leaf teas packaged in a unique vial or bag. Your first package comes with a reusable tea infuser which will have all your instagram followers jealous. 8-12 cups of tea. Love tea?... You can always upgrade to our other packages. Check out the great value of our other packages! Our #1 selling package! Each package comes with three to four specialized loose leaf teas packaged in a unique vial or bag. Your first package comes with a silicone or metal reusable tea infuser. Our teas are organic, hand-curated and unique. Discover new and exciting flavors of teas! Our teas are created in small batches, packaged with love and each package provides you with roughly 20-35 cups of tea (3 or 4 flavors). Life is too short to drink bad tea! Makes an amazing gift, the recipient will be blown away by the flavors and unique packaging. Not your average monthly tea box... This is the deluxe package with free shipping! This package contains 4 all full-sized tea (a combination of large vials and bags). Our teas are organic, hand curated and unique. You'll discover new and exciting flavors of teas! 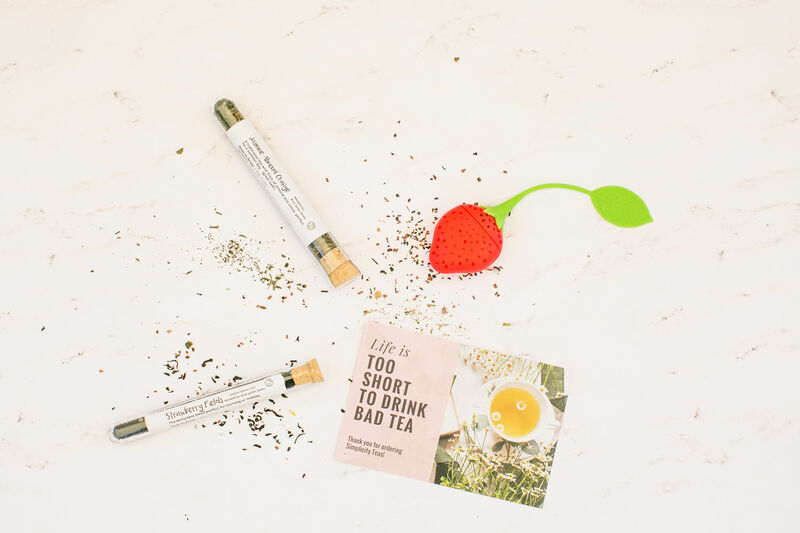 The initial package comes with a silicone or metal loose leaf tea infuser. Each month provides you with 30-45 cups of tea. Life is too short to drink bad tea! This also makes a great gift to a tea enthusiast in you life, they will be blown away by the unique packaging and amazing flavors! "Always has a great selection with health benefits and yummy flavors. Great customer service, and much better than any other I've tried"
"I absolutely love the tea I get each month! I always get a little something extra too, which is great. All of the tea flavors have been amazing, as well. 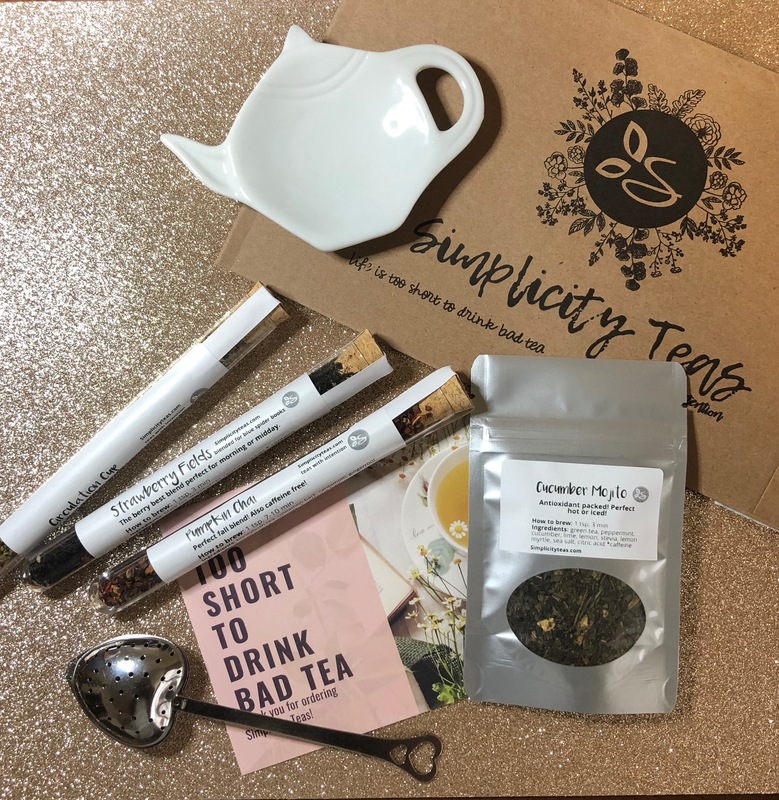 Highly recommend Simplicity Teas." 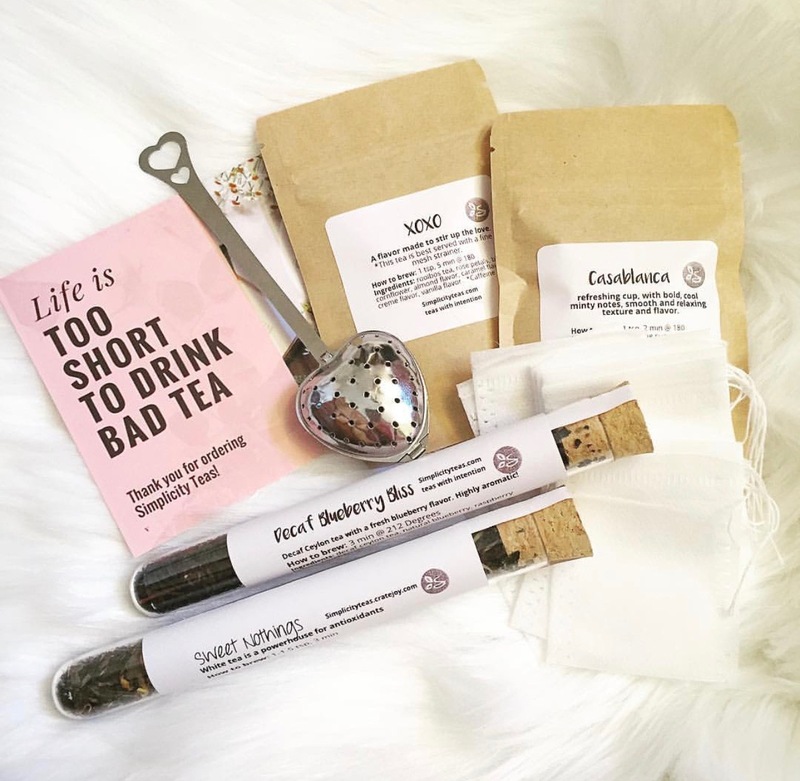 "I was so excited to get this tea and it didn’t disappoint! Hey smell amazing and taste delicious. The strainer that came with it is good quality and works well. SO worth it!"